Chicago, IL – 2015 – More bands were announced today as part of the final roster for RUIDO FEST, the first 3 day multi-stage outdoor music festival in U.S., showcasing Latin Post-Punk, Electronic, Hip-Hop, Rock, Psychedelia, Tropicalia, EDM, Reggae and Pop acts from all over the American continent and the world at the beautiful ADDAMS PARK in Pilsen-Chicago on the weekend of July 10th, 11th, & 12th. Banda de Turistas (Argentina), Triángulo de Amor Bizarro (España), División Minúscula (Mexico), Ceci Bastida (Mexico), Los Románticos de Zacatecas (Mexico) and Hurakan (USA), were recently confirmed to perform at Ruido Fest, music festival featuring both established and up and coming bands from all genres of Latin Alternative Music. More than 50 acts that together represent the wide variety of Latin music culture today will be feature in the 3 day festival that will also feature a variety of food stands, craft vendors and local artists art displays. 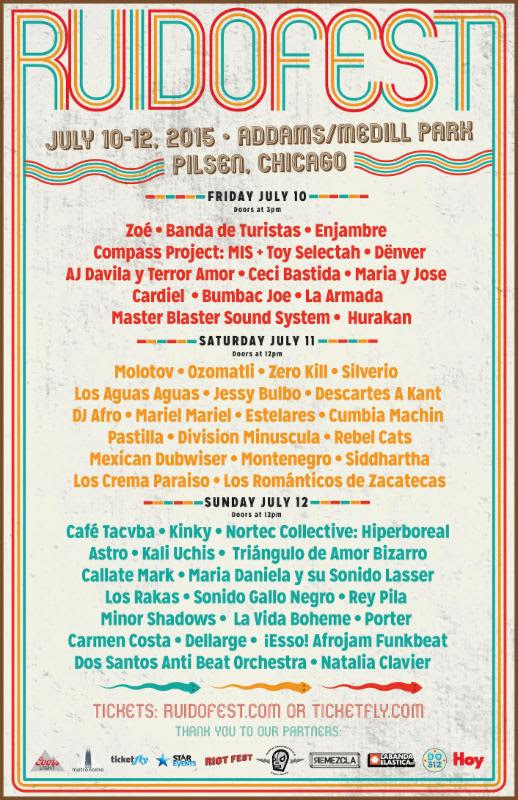 Riot Fest Presents, Rock Sin Anestesia, Metronome, and Star Events, the principal organizers behind Ruido Fest, are some of the most experienced large scale event organizers in the country, with strong ties to the Chicago Latin music industry and to local area communities.